How much is it really going to cost to accomplish this? Will we need to work and save for years? Or can we just sell everything, find a boat, and then go? That answer really depends on who’s asking and what your intentions are. Learning from past “sell everything and go” [mis]adventures, we’ve decided that it’ll be good to at least get a good estimate for how much money we’ll need to be able to buy a sailboat, fix it up, learn to sail it, and then sail around the world for a few years. Luckily, we’re not the first ones to try to do this. And even more fortunately, everyone has done it in a different way. But we’ll need a good starting point, any point, as a reference. Going through the different travel blogs, we came across a pretty detailed cruising blog by another restless adventuring couple, Pat and Ali from [Bumfuzzle](http://www.bumfuzzle.com/about-us/). What’s great is that they had the courage to publish their numbers: [What does it Cost to Cruise](http://www.bumfuzzle.com/blog/2013/03/19/what-does-it-cost-to-cruise/). Of course cruising and its costs will be different for everyone. So I’m going to go through their numbers, cross reference the listed months against their blog posts, and try to figure out what we can expect for burn rate, startup costs, incidental costs, recurring costs, and anything else that may make sense. Once that’s done, I’ll try to rework the numbers for 2014 dollars, and make adjustments for how we’d like to sail the world. And from there, we can work backwards to see if we can figure out a way to make this happen. Will there be sacrifices? Of course… but where would it make the most sense to penny pinch? Are there ways to reduce port & entry fees? Can we reduce or eliminate slip & mooring fees? How can we eat well and enjoy local cuisine without spending a fortune? Is there a way for us to control maintenance costs so that more of our resources can be devoted to keeping us under sail? So thanks Pat and Ali so VERY much! You guys have probably saved us thousands just by sharing your books with us. If you ever come across this blog or we bump into each other, we’d love to make you and your family dinner! 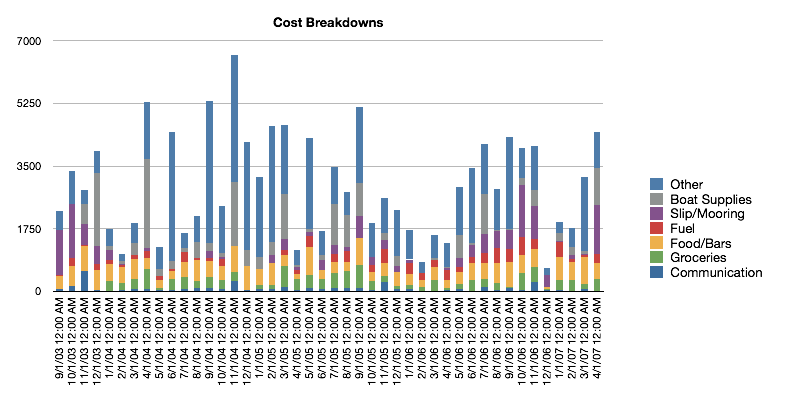 I’ve created a huge spreadsheet called “Bumfuzzle Demuxing”… and here’s a little preview of some of the pretty charts I’m creating to help us visualize exactly what an undertaking this will be.